Proxima b is the nearest exoplanet to Earth – but does it have a friend? The closest star to the solar system may have yet another planet. Proxima Centauri, which is just about 4.2 light-years away, may be home to a frigid world six times as big as Earth. Mario Damasso at the Observatory of Turin in Italy and Fabio Del Sordo at the University of Crete announced their find at the Breakthrough Discuss conference in California on 12 April. They spotted the new exoplanet, called Proxima c, by looking for signs of the star wiggling back and forth as it is pulled by an orbiting planet’s gravity. This is the same method used by a different group of astronomers in 2016 to detect Proxima Centauri’s other planet, Proxima b. 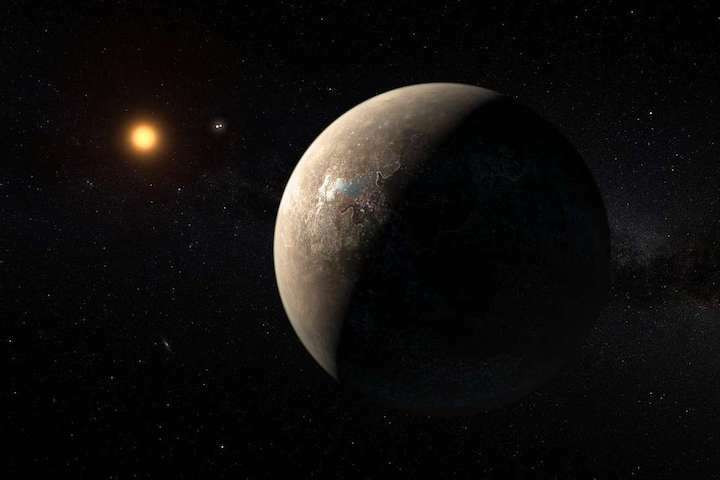 But while Proxima b may orbit in the star’s habitable zone, where it’s neither too hot nor too cold for liquid water on the planet’s surface, Proxima c is much farther out, about 1.5 times the distance between Earth and the sun. That means that it is very cold, around -233° C. From the star’s wiggles, it appears that Proxima c takes about 1936 Earth days to circle its star and is about six times the size of Earth, making it an example of a super-Earth. It’s possible that Proxima c formed closer to its star and then migrated outward, Del Sordo said. One thing that could throw a wrench into the detection is that these sort of wiggles could be caused by several smaller planets in different orbits rather than just one big one.